Columbus Best Schools Report Cards. Report cards for central Ohio schools were released last week. Columbus Best Schools Report Cards? Columbus as in greater Columbus…which central Ohio schools got the best report cards for the 2011- 2012 school year? Columbus, Dublin, Gahanna, Grandview Heights, Hilliard, Lewis Center, New Albany, Powell, Upper Arlington, Westerville and Worthington… and for me some more remote areas in Delaware County, communities including the City of Delaware, Galena, Sunbury, etc. The information here is geographic based on where I live and work. The state has preliminary report cards for all of the school districts in the state, in a spread sheet. The grades shown on the sites familiar report card section are the 2010 – 2011 report cards. Once the school report cards are no longer considered “preliminary” they will be in the report card section of the state site. The Ohio Department of Education released the preliminary grades last Wednesday. The schools are school districts in northern Franklin County and southern Delaware County! I pulled that information (the grades by school district) from a Columbus Dispatch database last week. The Columbus Dispatch cut me off on the 18th. I was a frequent user in October 2012… Mostly on Thursday. I was mostly looking at the very delayed school report card information. The long delayed and preliminary Ohio schools report cards for central Ohio school districts. The Ohio Department of Education has a spreadsheet with the same information. It is not as fun to use as the Columbus Dispatch database of the spread sheet data. With data for all Ohio school districts, the word “unwieldy” comes to mind. 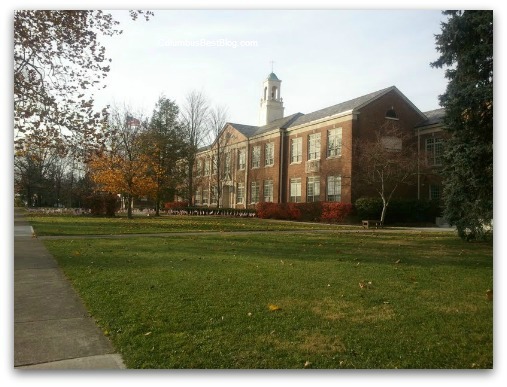 Pictured is Kilbourne Middle School in Worthington, Ohio. It was the Worthington High School long ago. Next post: Columbus Dispatch Subscriber?